Landlords are always cautious because of the associated risks with renting out units that might lead to financial distress and lawsuits. It is a fact that landlords face a variety of risks on a daily basis. The most significant and devastating of them happen to be the risk of lawsuits. Anything can result in a lawsuit such as injuries caused by faulty appliances installed at the rental unit or tenant’s dog biting neighborhood kids, rehab work or harassment. So are there any productive strategies that can minimize risk factor and allow landlords to live in peace? Yes indeed! There are some strategies that will enable rental property owners to ensure protection of their assets, income as well as their own self. 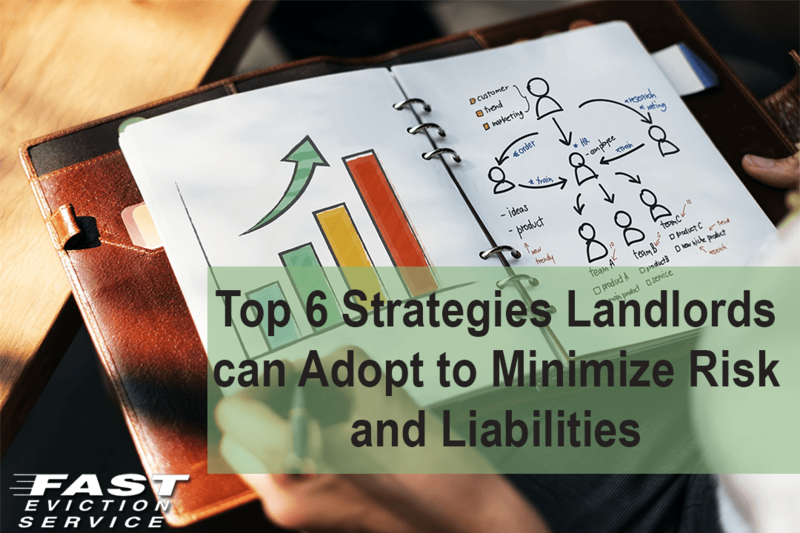 Check out the top six strategies that can help landlords curb liabilities and prevent risks. Never ignore any repair work and always perform it in a timely manner with quality renovations. It is the landlord’s responsibility to check and be certain that any repair job is carried out correctly. Anything can lead to legal trouble such as faulty wires on the washing machine, untreated mold or mixing up of hot and cold water pipes, etc. What landlords need to do to prevent risks is to ensure that tenants seldom get the chance to complain about issues by performing regular inspections and if there is a complaint it must be resolved immediately and reliably. We suggest that you hire an in-house general contractor for performing house inspections and renovations. You can also hire in-house property manager to receive a walk through checklist whenever a new tenant moves into your rental unit. Always keep paper trails of everything done on the property such as inspection reports, receipts, tenant maintenance requests and any notices sent to the tenants, etc. This way, you will have solid proof to defend yourself if a case case is brought against you in court. Alternately, you can go paperless and keep digital/electronic versions of key documents and receipts in dedicated property management software. Nobody likes to pay for insurance but in case a claim is filed against you, insurance will protect you. Think about getting basic property insurance that must include coverage for storms, fire and floods. Or, you can get an income policy to cover rental gaps in case you need to evict your tenants in the future. Also, check if your tenants carry renter’s insurance and renew it timely, if they don’t then ask them to get it as it is inexpensive but very useful in hard times. If tenants have pets then you must check if they have additional insurance coverage according to the pet’s breed. Experienced landlords swear by this strategy; if you have made sufficient investments in real estate and have been in this business long enough then remember that you might need to have to call an attorney for any minor or major task such as writing a warning letter. You can consider using Limited Liability Corporations or LLCs, keep your identity hidden by investing via partnerships, using business address instead of using your residential address, limiting liabilities by separating personal and business assets so as to remain a less visible and attractive target for lawsuits. You can get a great legal buffer from third-party property management firms and real estate agents because these companies physically limit landlords from making legal mistakes and will instantly inform you when you can claim for insurance. They might even offer legal representation to curb expenditures if there is a lawsuit filed against you. These top 6 strategies landlords can adopt to minimize legal risks can be worth their weight in gold if, or when a problem tenant choses to make your life miserable with a tenant lawsuit against you. With these strategies in place, it makes it much harder for the tenant to sue and eliminates or limits the judgments a court may award them against you.